Dentistry is a cruel, cold art, at least in the eyes of some. So principals warmed up the ambience for a popular young dentist in practice with a vibrant orthodontist on the Mediterranean island of Majorca. Remodeling 2,600 square feet previously occupied by a retail branch of a bank, Oliver and Hernaiz started at the facade, resurfacing the canopy in gray stucco and adding a glass storefront with vertical strips of white solid-surfacing. The entry hall, reception station, and waiting room all benefit from the friendliness of oak, used for planks on the ceiling and strips on the walls. Floor tiles that look like blond timber are actually ceramic, sneakily hygienic. “Wood tones always make you feel at home,” Hernaiz notes. 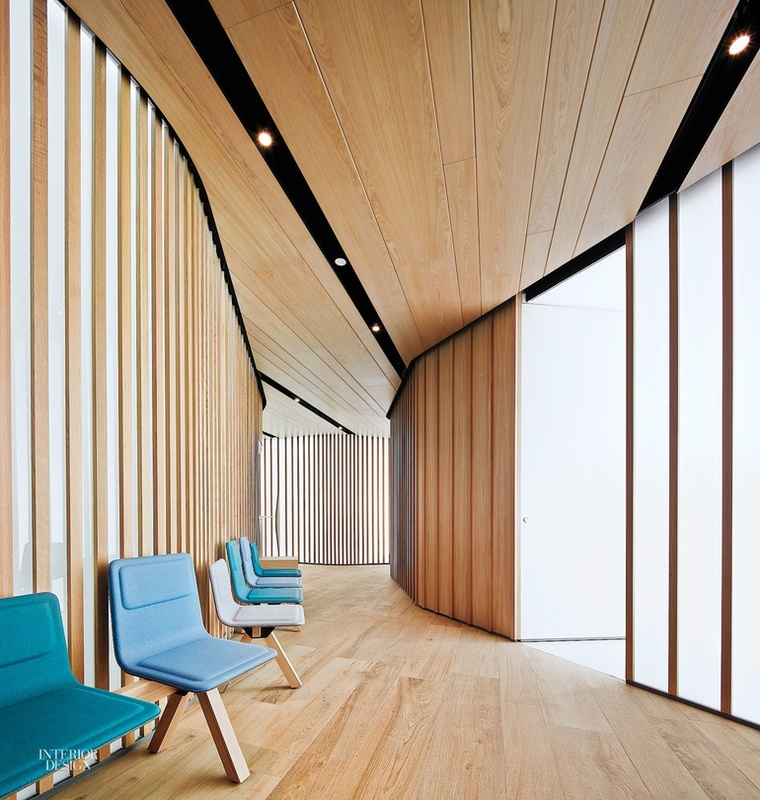 To ease patients toward the treatment rooms, the oak strips continue along the curved walls of a corridor that sweeps gently back, with the occasional strip bulging forward to become a door pull. Each treatment room beyond has a crisper aesthetic. “To make you feel that you are in precise hands,” Oliver explains. Here, a white stretched ceiling system conceals energy-efficient LED fixtures and reduces glare. There’s also the occasional accent spotlight. You do want your dentist to be able to see clearly, after all. Project Team: Rebeca Lavín; Joana Aguilera; Rosa Fuentes; Amalia Stavropoulou; Nicola Kozhuharov; Stela Dineva; Jorge Ramón.